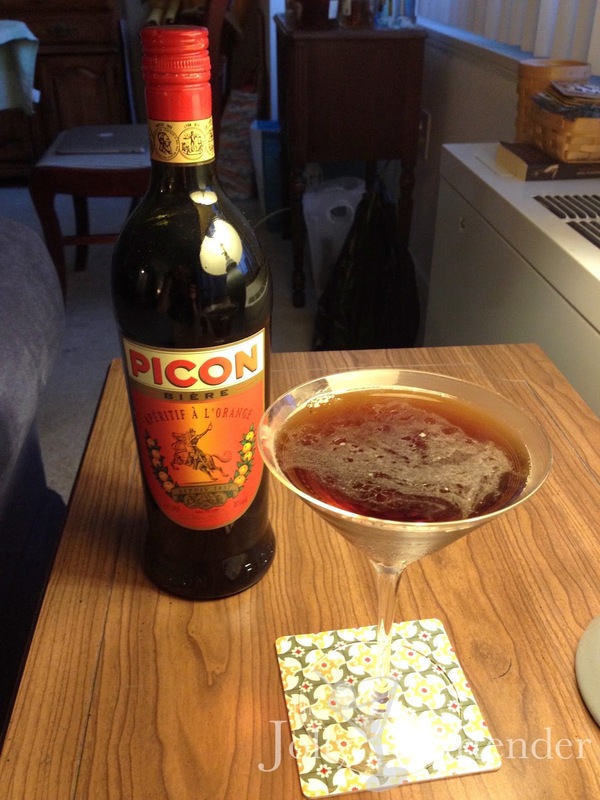 I'm circling back to this drink I made almost a year ago when I thought I had a good substitute for Amer Picon. It turns out that I wasn't too far off except mine wasn't bitter or dark enough. A little about Amer Picon: it's not available in the U.S. and bartenders are trying to recreate its flavor and color for cocktails like this. Most are using a mild amaro, cola, bitter oranges, cloves. It's impossible to perfectly copy it. The bottle I brought back from Paris is Picon Biere, which the French use to make their cheap beer taste stronger. That's fine, and I liked it enough with soda. But I got it for cocktails or to have by itself. That said, I think that there was a proportionality problem with this drink. It was too large, and didn't use the Canadian whisky to good effect. It tasted too much like root beer, which is a little of what Picon tastes like. I think a half ounce of vermouth and Picon each is sufficient to add flavor without overdoing it. This drink was so big I was tempted to transfer it into a coffee mug.